The hanging of James P. Casey and Charles Cora, Frank Leslie’s Illustrated Newspaper, 1856. In June 1851, an Australian with a bad reputation became the first victim of San Francisco’s”vigilance” committee. Caught in the act of stealing a safe, Jenkins, along with three other Australians from Sydney, were subjected to a mock trial, then marched to San Francisco’s Custom House, where they all had nooses put around their necks and were hanged on the spot. A second San Francisco “vigilance” committee formed in 1856 and lynchedtwo men, James P. Casey and Charles Cora. Casey had shot and killed a newspaper editor named James King who had been bolding assaulting evildoers in his newspaper. Charles Cora, an Italian gambler, had shot and killed a U.S. marshal named Richardson in November 1855. A mob of about 6,000 persons either helped to perpetrate or witnessed the lynching of the two men. Casey and Cora were seized and hanged from projecting beams rigged on the roof of a building on Sacramento Street. Before the mob dissipated, two more unidentified men were hung from the beams for unknown reasons. Other non-vigilante lynchings were also occurring with regularity, such as the hanging of two slaves on July 11, 1856, in South Carolina for aiding a runaway slave, and the hanging of four black male slaves on December 5th of the same year, allegedly for “revolting” against the state of Tennessee. Though lynchings were always more prone to blacks, two white criminals were in Iowa in 1857, one for murder, and the other for counterfeiting and theft. 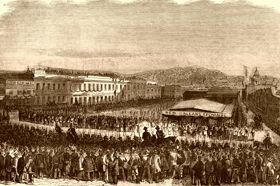 April 9, 1859, saw Colorado’s first execution in the settlement of Denver. John Stoefel was hanged for shooting his brother-in-law. Both men were gold prospectors, and Stoefel wanted his brother-in-law’s gold dust. Because the nearest official court was in Leavenworth, Kansas, a “people’s court” was assembled, where Stoefel was convicted and hanged within 48 hours of the murder. Though Denver consisted of only 150 buildings at the time, about 1,000 spectators attended the Stoefel hanging. In the Antebellum days of Texas between 1846 and 1861, vigilantes instigated most of the lynchings. Often these vigilantes imitated legal court procedure, trying the offender before a vigilante judge and jury. Though conviction most often resulted in whipping, 140 offenders were lynched during this time frame. 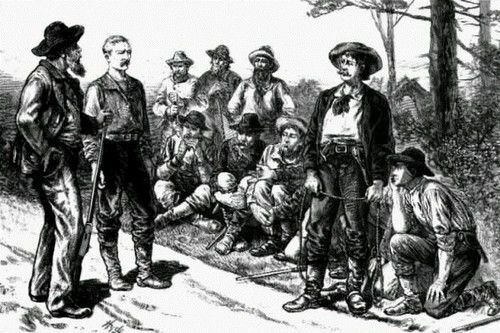 Vigilante groups increased in frequency with the approach of the Civil War when mobs frequently sought out suspected slave rebels and white abolitionists. The tension came to a head on September 13, 1860, when abolitionist Methodist minister Anthony Bewley was lynched in Fort Worth, Texas. Bewley, born in Tennessee in 1804, had established a mission sixteen miles south of Fort Worth by 1858. When vigilance committees alleged in the summer of 1860 that there was a widespread abolitionist plot to burn Texas towns and murder their citizens, suspicion immediately fell upon Bewley and other outspoken critics of slavery. Recognizing the danger, Bewley left for Kansas in mid-July with part of his family. A Texas posse caught up with him near Cassville, Missouri and returned him to Fort Worth on September 13. Late that night, vigilantes seized Bewley and delivered him into the hands of a waiting lynch mob. His body was allowed to hang until the next day when he was buried in a shallow grave. Three weeks later his bones were unearthed, stripped of their remaining flesh, and placed on top of Ephraim Daggett’s storehouse, where children made a habit of playing with them. But the violence in Texas did not end with Bewley. As rumors continued of a slave insurrection, it led to the lynching of an estimated thirty to fifty slaves and possibly more than twenty whites over the next two years. The entire affair culminated in the greatest mass lynching in the history of the state, in at what is now called “The Great Hanging at Gainesville.” During a thirteen-day period in October 1862, vigilantes hanged 41 suspected Unionists. During the same year, the Sioux Uprising resulted in more than 500 dead white settlers on August 17th. Reacting from broken government promises and corrupt Indian agents, as well as going hungry when promised food was not distributed, the uprising began when four young Sioux murdered five white settlers in Acton, Minnesota. A military court sentenced 303 Santee Sioux to die, but President Abraham Lincoln reduced the list to 38. Outraged, several hundred white civilians tried to lynch the 303 Santee Sioux on December 4, 1862. The soldiers, protecting the prisoners at a camp on the Minnesota River, were able to stop the angry crowd. 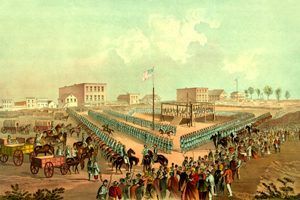 However, on December 16, 1862, the 38 condemned Indian prisoners were hangedin Mankato, Minnesota, an event that is now known as the largest mass hanging in United States history. Afterward, the government nullified the 1951 treaty with the Santee Sioux. Active Civil War tensions were brewing everywhere at this time and on January 23, 1863, Confederate soldiers hanged a Fort Smith, Arkansas attorney. Martin Hart had previously served in the Texas legislature where he spoke out against succession. However, when Texas became a part of the Confederacy, Martin resigned his government post. Soon, he organized the Greenville Guards, pledging the company’s services “in defense of Texas” against invasion. Under color of a Confederate commission, however, he spied against the Confederacy. In Arkansas, he led a series of rear-guard actions against Confederate forces and is alleged to have murdered at least two prominent secessionists. He was captured on January 18 by Confederate forces and hanged five days later. More tension was brewing in New York City when its male population was called to war. On July 13, 1863, three days of massive anti-draft protests began. 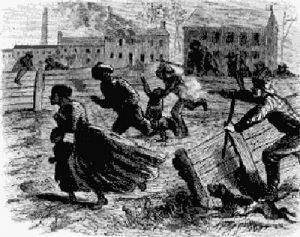 In what was the nation’s bloodiest riot in history, 50,000 Civil War draft protesters burned buildings, stores, and draft offices, and actively attacked the police. Protestors clubbed, lynched, and shot large numbers of blacks, who they blamed for the government’s position. When troops returning from Gettysburg finally restored order, 1,200 were dead. While the rest of the nation was busy fighting the Civil War, the deadliest campaign of vigilante justice in American history was erupting in the Rocky Mountains. Fighting violent crime in a remote corner beyond the reach of the government, were the Montana Vigilantes. Sweeping through the gold-mining towns of southwest Montana, the armed horseman hanged 21 troublemakers in the first two months of 1864 alone. One of these so-called troublemakers was elected Sheriff Henry Plummer, who was said to be the leader of a band of Road Agents called the Innocents. After hanging Plummer and his two main deputies on January 10, 1864, the Vigilantes went on to hang more bandits in such places as Hellgate (Missoula), Cottonwood (Deer Lodge), Fort Owen and Virginia City. Though these Montana Vigilantes are still revered in Montana as founding fathers, historians have provided evidence that the whole thing regarding Sheriff Plummer and his Road Agents may very well have been a fraud. The evidence suggests that many of the early stories, on which the outlaw tale is based, were written by the editor of the Virginia City Newspaper, who was a member of the vigilantes and the story was fabricated to cover up the real lawlessness in the Montana Territory – the vigilantes themselves. Furthermore, the robberies taking place in Montana did not cease after the twenty-one men were hanged in January and February of 1864. In fact, after the “Plummer Gang” hangings, the robberies showed more evidence of organized criminal activity and the number of thefts increased. 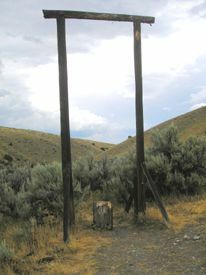 Random lynchings continued in Montana Territory throughout the 1860s even though territorial courts were in place. Over a six-year period, they lynched more than fifty men without trials until a backlash against extralegal justice finally took hold around 1870. By late that same decade, however, Montana was again stirring with new settlement as railroad construction pushed westward and the vigilantes once again became active by making threats for “undesirables” to leave the territory. Reliance on mob rule in Montana became so ingrained that in 1883, a Helena newspaper editor advocated a return to “decent, orderly lynching” as a legitimate tool of social control.